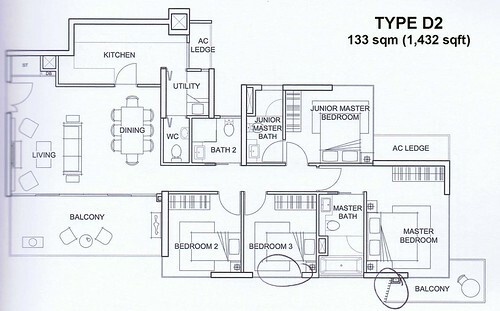 This unit in question is a 1432sqft, 4-bedroom (Type D2). As you enter the main door, you find the living/dining room - this is a rectangular area that seems a tad small for a 4-bedder unit. However, it can still comfortably fit a 6-seater long dining table and a 3-seater sofa (see photo). The area comes with 60cm x 60cm compressed marble floors (Tree House only has homogenous-tile flooring) and 2.9m ceiling. 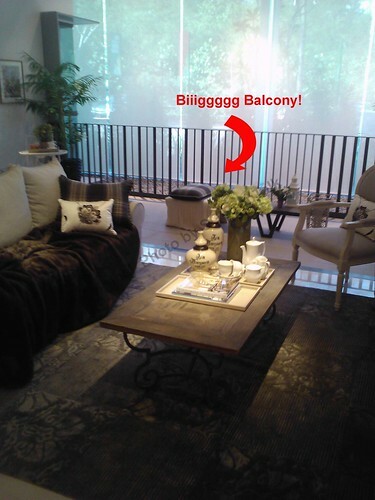 The balcony is also rectangular-shaped and disproportionately large compared to the living/dining room - we reckon the area is about 100sqft. The marketing agent has suggested for the dining table to be pushed out to the balcony so that you get more living room space, which is a considerable option. The kitchen is again a rectangular strip of an area and of fairly good size. You get top and bottom kitchen cabinets on both sides of the walls, which is quite generous. The kitchen also comes with "Turbo" hob/hood/oven/microwave from Italy (although we understand that some of their products are also manufactured in Taiwan) and a fridge (sorry but we forget to check the brand). The "yard" area is actually just a tiny extension at the end of the kitchen, between the cupboard that houses the washer/dryer (separate units will have to be stacked one on top of the other) and the utility (aka maid's) room. The window in the "yard" provides natural lighting and ventilation to the kitchen. 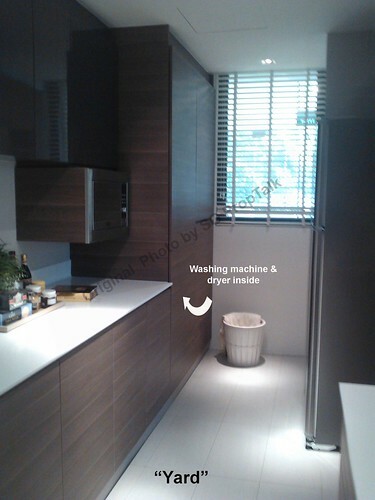 We were also told that an extendable laundry rack will be provided for you to hang your laundry outside the window. 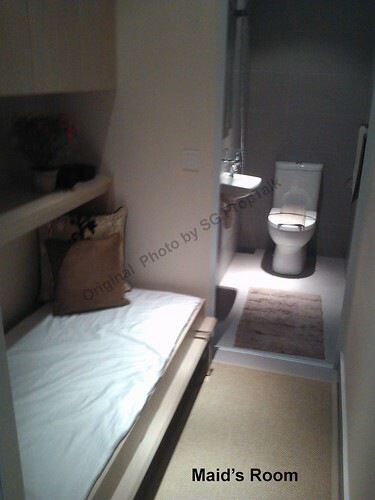 One unique feature in the unit is found in the utility room - it comes with an attached bathroom! So the utility is probably designed with the maid in mind. 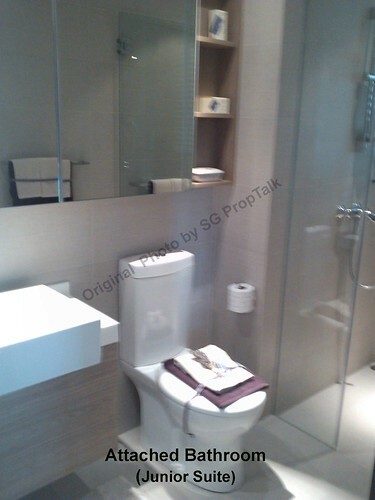 The common bathroom is decent-sized and comes with homogenous-tile floors and ceramic walls. 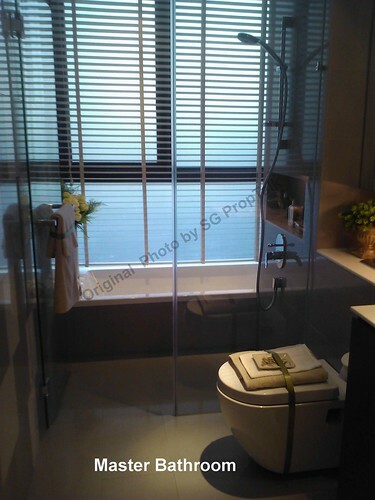 You also get "Hansgrohe" bathroom fittings and "Bravat" toilet bowl/sink. 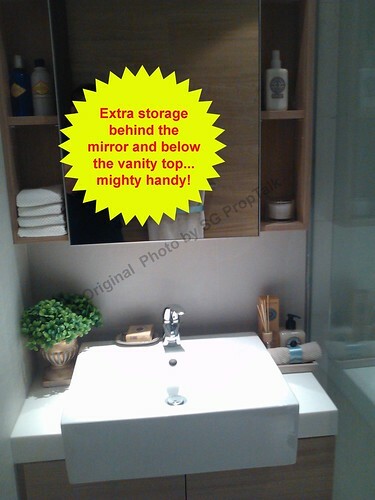 We like the extra storage behind the bathroom mirror, in addition to the vanity cupboard below the bath-sink. However, you will have to make do with the standard wall-mounted shower in the shower stall. The other thing we like about the common bathroom is a "feature wall" made from ceramic tiles with a "wood-like" look/feel to it. The 2 common bedrooms are almost square-shaped and seem quite good size - the absence of bay windows may be a contributing factor. The bedrooms come with small timber-strip flooring, unlike Tree House where you only get laminate floors. 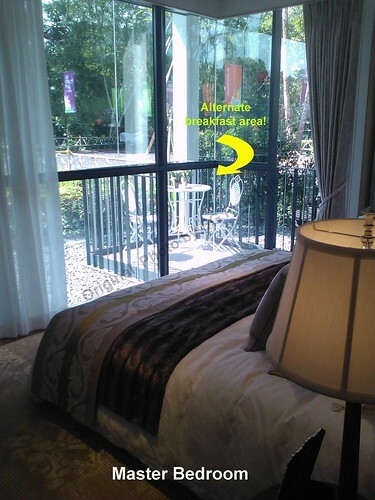 The junior suite is quite spacious (Queen bed recommended) , while the attached bathroom is also good-sized. But again you only get the standard wall-mounted shower in the shower stall. The master bedroom will easily fit a King bed and it comes with a small L-shaped balcony that will allow you to place a small breakfast table and two chairs. The master bathroom is huge and has compressed-marble floors and walls, which gives it a classy look. It also comes with a long-bath and an adjacent standing shower, which is nice. but what is even "nicer" is that the standing shower stall is fitted with both a rain-shower as well as wall-mounted shower. We were told that for a limited period, developer is providing "stamp duty rebate" as incentive to buyers - this rebate will be given upon TOP of the project. • The layout of the blocks are designed to maximum the number of units with unblocked view. • NO bay windows or planters for all unit types. This makes the apartments feel "bigger" than originally perceived. 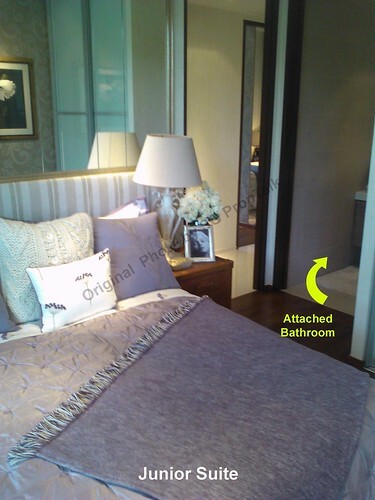 The 3- and 4-bedroom showflats are surprisingly spacious compared to the actual size. 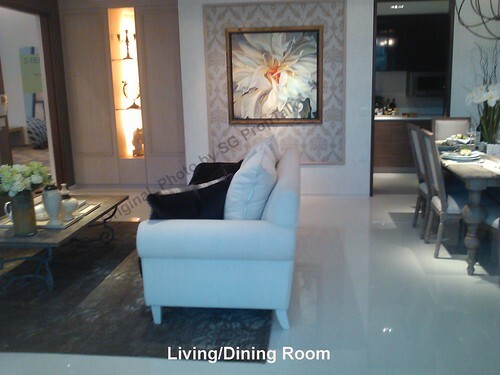 • The quality of furnishing and fittings are definitely better than what we have seen in Tree House. • Location - this is the main issue we have with Foresque, which is located almost in the middle of nowhere. 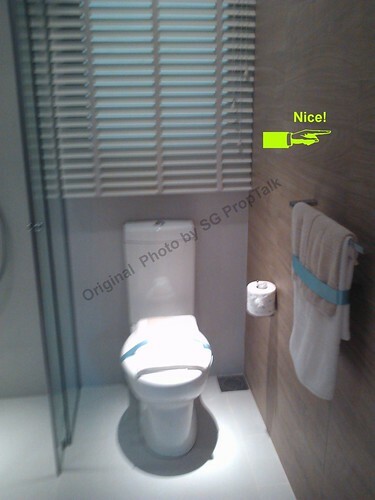 The nearest amenities are those found around the Zhenghua HDB estate, which is probably a good 15 minutes' walk away. The Pending LRT station is at least a 10 minutes' walk, while you will need transportation to get to the nearest MRT Station (i.e. the upcoming Hillview Station, scheduled to be completed in 2015). The wife and I were told that a shutter-bus service to Hillview MRT Station will be provided to residents for the first year. However, we reckon that you are probably stuffed if you do not own a vehicle. • There is no "wow" factor in the facility offerings in Foresque, which definitely pale in comparison to Tree House. 2 comments to ''Foresque Residences: Review (Part 2)"
Nice review. What are your thoughts on the 2 bedroom units? Any pics? Thanks. Thanks. We did not look at the 2-bedder showflat as we could only spare an hour in the sales gallery (before we had to go pick our son from his Maths class - you know how it is if you have primary school-going kids!). 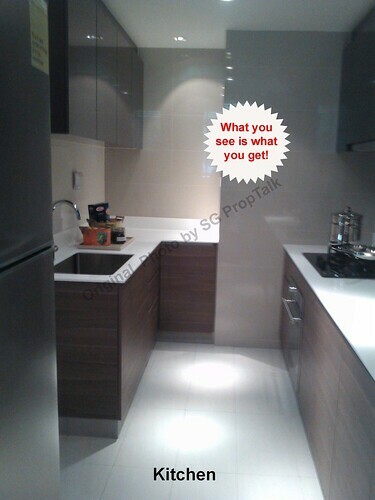 So no thoughts nor pics on the 2-bedroom showflat, sorry! 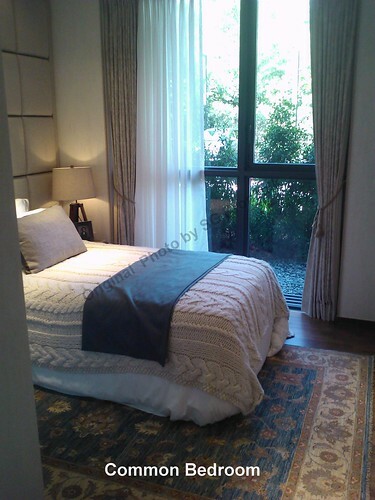 But we DO have pics of the 3-bedder showflat and will try to post these over the next day or two.